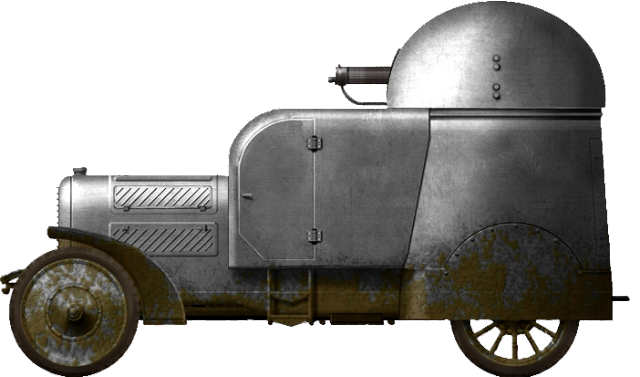 The Austro-Daimler Panzerautomobil, along with the Franco-Russian Charron, can be considered to be the first ‘modern’ armored cars. With first development already starting in 1904 by graduate engineer Paul Daimler, the vehicle was built in 1905 and had four-wheel drive -revolutionary for its time. Together with a fully armored body and a fully rotating turret, the vehicle featured many elements which would be used in later armored car designs. On August 11th, 1899, the German engineer Gottlieb Daimler, already owning a factory in Germany, established a car factory in Wiener-Neustadt, called Österreichische Daimler Motoren Kommanditgesellschaft Bierenz Fischer und Co. The factory was established to manufacture cars that were designed by the parent company Daimler Motoren Gesellschaft from Germany. The son of Gottlieb Daimler, Dipl.-Ing. Paul Daimler, was to become the manager of the company in 1900, but due to the death of his father and his own illness, he took the job two years later, in 1902. In 1902, Hauptmann Ludwig Tlaskal-Hochwell made the first attempts to design a 4×4 drive (German: 4-Radantrieb) to be used for a tractor. Probably based on this first experience, Paul Daimler started to design a 4×4 drive himself, around March 1903. He received suggestions from Archduke Leopold Salvator, who had attended the Technical Military Academy. The Austro-Daimler Panzerautomobil featured a fully enclosed armored body, made of 3 mm thick nickel steel with rounded edges. The engine was mounted at the front in an armored housing with a grille in the front and louvers on the sides and top. The crew compartment was located behind the engine, housing two crewmen, the driver and gunner. The driver could enter through a door on the left side of the vehicle with a little step mounted below it to ease entrance. Two vision slits were placed in the front armor plate, but none on the side, therefore leaving little view arc for the driver. The solution for this problem was that the driver’s seat and the steering device could be lifted. A hatch was made in the roof and when lifted, the driver could poke his head out of the vehicle. On several photos, a second man can be seen seated in the driver’s compartment. This is not a third crew member as is commonly suspected in secondary sources, but the gunner when he does not need to fire the machine gun in the turret. 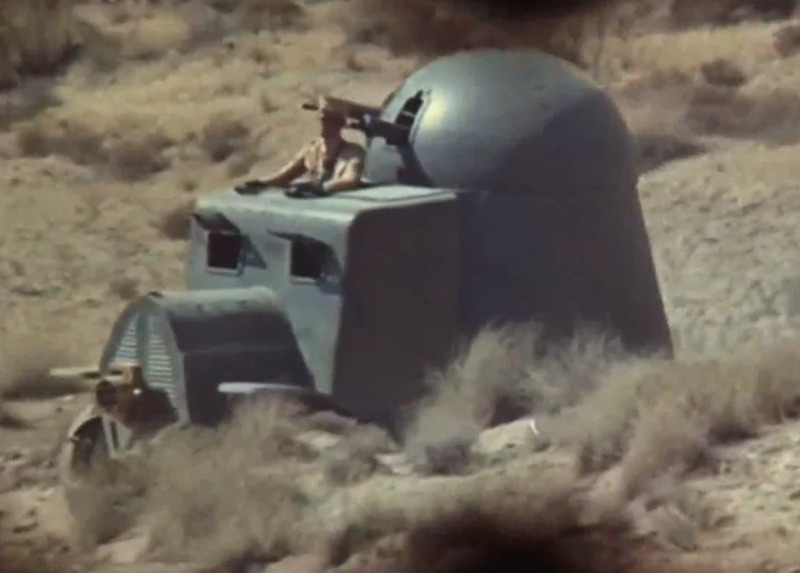 On the back of the vehicle stood a tower-like hull and a fully traversable, enclosed dome-shaped turret on top of it. The turret armor was 3.5 mm thick and there was room for one water-cooled 7.7 mm Maxim machine gun. A door was located in the back of the hull through which the gunner could enter. The vehicle was powered by a Daimler 4-cylinder piston carburetor engine with a capacity of 4.4 liters, producing 30 hp at 1050 rpm (from Spielberger, other sources mention 32 or 35 hp). Fuel was pumped to the engine using negative pressure and the fuel tanks had enough capacity to drive for ten hours on road. The power delivered by the engine was transmitted through a drive shaft with lockable differentials to the wheels, contrary to the then usual chain-driven back wheels. The vehicle featured a 4-speed cone clutch, covered in leather. The leaf spring suspended front wheels were covered in nickel-steel and had a diameter of 83 centimeters. The spoked back wheels were made of wood, had a diameter of 92 centimeters, and were partially covered by an armored plating. The wheels were shod with solid rubber tires. The vehicle was completed in early November, 1905. The first trials took place in front of the factory and the attendants were impressed by the performance of the 4-wheel drive and its ability to take slopes of 60 per cent with a short run-up. The vehicle was offered both to the German and Austro-Hungarian Empire, but the German War Ministry turned down the offer. The vehicle presumably remained at the factory until it was showcased at the 6th Wiener Nationaler Automobilausstellung (Eng: Vienna’s National Automotive Exhibition) in March 1906. The 6th National automotive exhibition in Vienna was held in the building of the Gartenbau Gesellschaft (Eng: Horticultural Society) and the Panzerautomobil was to be the main attraction of the Daimler Motorengesellschaft booth. 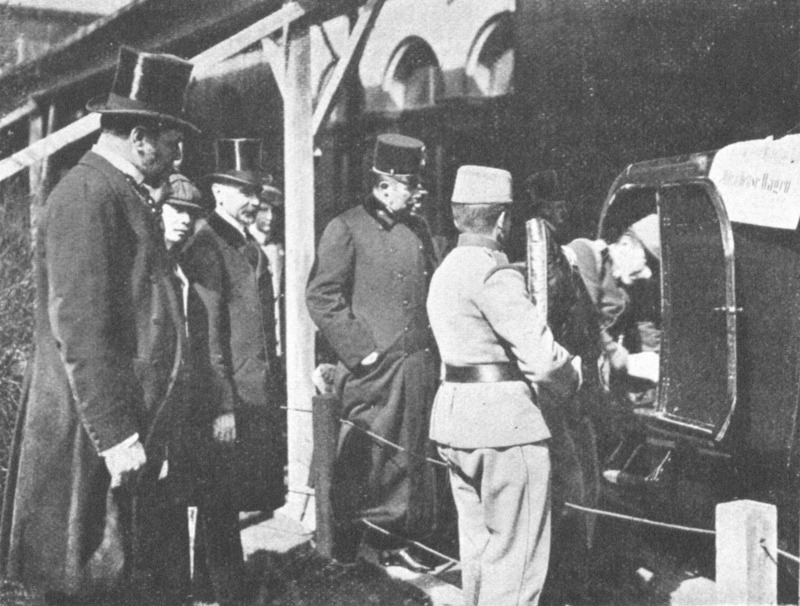 However, due to difficulties, the vehicle could initially not be placed inside the hall, and when Archduke Franz Ferdinand visited the exhibition on March 18, the Panzerautomobil was still on display in the garden. The vehicle’s technical details were explained to him by Hauptmann Robert Wolf, and the Archduke seemed satisfied. The following day, the Panzerautomobil was placed inside the hall. On March 20, the exhibition was visited by the Emperor himself, and when he visited the Daimler booth, he was first introduced to director Bernhard, after which the technical details of the vehicle were explained to him by the president of the Militär-Technischen Comité (Eng: Military Technical Committee), F.M.L. Ritter von Wuich, who explained that the vehicle was made after their wishes. The Emperor closely examined the vehicle from all angles, and Hauptmann Wolf noted that the next armored car would be armed with two machine guns. This is an interesting statement as it raises the question whether the vehicle was modified after the exhibition or if a completely new armored car was being built. Other mentionable noble visitors were Archduke Franz Salvator who visited on the 21st, and Archduke Friedrich who visited on the 27th. Both were very interested in the Panzerautomobil and how it worked, so they were both accompanied by Hauptmann Wolf, who mentioned that the vehicle could carry 14,000 ammunition rounds, could go 45 km/h with a 32 hp engine, and that the vehicle weighed 1,900 to 2,000 kg, although he told Friedrich that the other armored car had better armor and as a consequence would be around 700 kg heavier. This again raises the question of a possible second vehicle. Another officer who visited the exhibition was Günther Burstyn. When he saw the armored car, he realised the big potential of armored vehicles but also the limited off-road potential of wheeled vehicles. He started to look for an alternative and decided upon metal plates, connected to each other, which looped around the wheels. He made a design which he named Motorgeschütz. This design can be considered as one of the precursors of the tank which appeared in 1916, but it was never built. Between the exhibition in Vienna in March and the Kaisermanöver (Eng: Emperor Maneuvers, annual wargames) in August/September of 1906, the vehicle received some heavy modifications. The most obvious change was the new designed turret which was now opened in the back and a second machine gun could be fitted in a newly added gun port. The armor was thickened to 4 mm instead of 3, and the 30 hp engine was replaced by a more powerful 40 hp engine. These changes raised the combined weight to 3,200 kg. These modifications had a severe impact on the specifications of the vehicle and as such has caused much confusion between researchers. 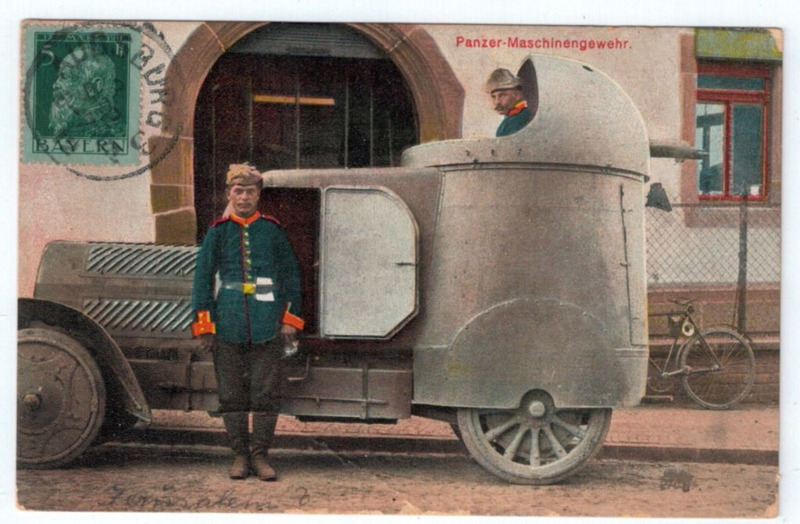 A Postcard showing the Panzerautomobil in color. This picture is probably taken during the maneuvers in 1906. Photo: Landships Forum. Illustration of the Austro-Daimler Panzerautomobil, produced by Leander Jobse, based on work by David Bocquelet. On April 11, Archdukes Friedrich and Franz Salvator, Fürst Schwarzenberg, and several officers and generals visited the Daimler factory in Wiener Neustadt. They came to inspect the new Trainwagen and Panzerautomobil and drove around in them. They possibly tested the vehicles to see whether to use them during the upcoming Kaisermanöver or not. Eventually, they decided to do. In August 1906, the armored car grouped up with several other vehicles in Vienna and from there moved to Schlesien, the area where the Emperor maneuvers were to take place. This was the first public appearance of the armored car with changes. A popular anecdote claims that, when the vehicle was shown to Emperor Franz Joseph and his generals, all sitting on horses, one of the horses was scared of the noise produced by the engine. The horse tried to flee and in doing so, threw a general from his back. The Emperor, then declared that he was not interested in ordering the vehicle. Besides this incident, another reason for not accepting the vehicle was caused by conservatism. The old strategy worked, the new technology had not proven itself yet, so change was not seen as needed. It must also be considered that introducing such a vehicle into the army would have necessitated new supply chains for gasoline, lubricating oil and spare parts, especially to the front lines, sometimes over difficult terrain, and the hiring of new trained mechanics and crewmen. However, taking into consideration that regular trucks were also slowly being adopted, none of these issues seem to have been insurmountable. After it became clear that the Austro-Hungarian Army was not interested in ordering the vehicle, Austro-Daimler asked permission from the War Ministry to offer the vehicle to France, as well as being allowed to exhibit the vehicle in Berlin. This request was accepted. Why Berlin is mentioned in sources is rather curious, it may be an error, as it should state Paris, where the armored car was indeed exhibited in the Grand Palais in December 1906. The Consul General of the Dual Monarchy in France, Ernst Jillenek, as a representative of Daimler, brought it under attention in France under the name Mercedes, after his daughter’s name, and so the vehicle became known in France as the Austro Daimler Mercedes de 45 cv. France was rather interested in the vehicle, not in order to acquire it, but to compare it to the domestically built CGV armored car. As such, in January 1907, the armored car was handed over to the French Army and first demonstrated in front of the French Minister of War, General Picquart at the Mercedes plant in Puteaux. Several experts were present as well, and seemed to be impressed by the performance of the vehicle on rough terrain. The vehicle was also tested at Fort Mont-Valérien, west of Paris, specifically chosen for its rough terrain. During the tests, the vehicle performed above expectations. On May 4th, 1909, the Commision d’étude des armes portatives et de petit calibre, (Eng: Commission for the study of portable and small firearms), released a report that included information about the Austro-Daimler Panzerautomobil, as well as the Charron and experience from Generals. 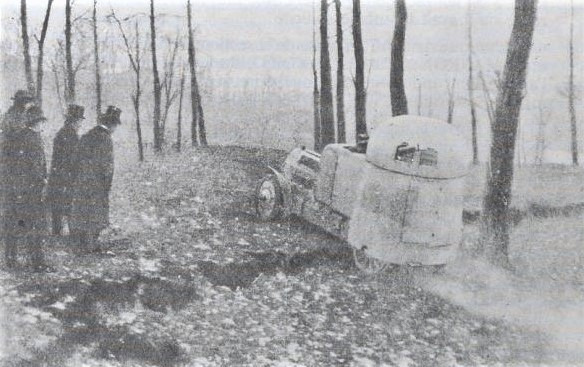 It concluded that contemporary armored cars were not yet fit for military service, due to their relatively bad off-road capabilities and high production price. 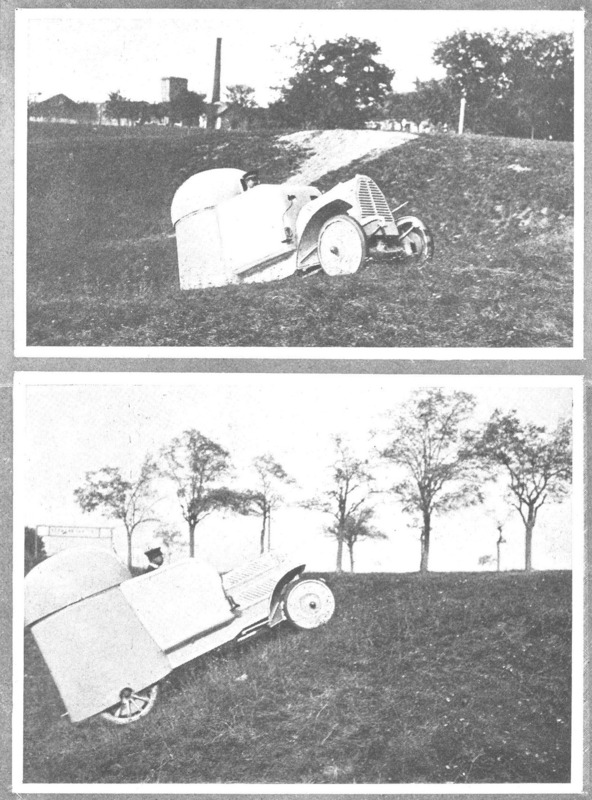 After the French trials, the vehicle returned to Austria, and was most likely taken apart several years later. It is sometimes suggested that it may have been used in Galicia during the First World War, but this is only speculation. 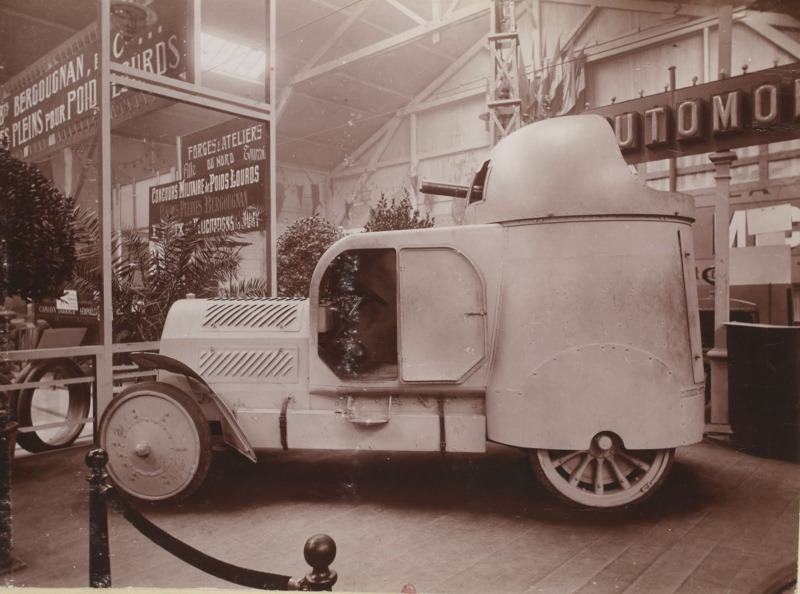 When the vehicle was first shown to the Austro-Hungarian press, they were very optimistic and enthusiastic about the concept of an armored car, and in military circles, the car was also received with great interest. The same happened in France. Although impressed by the vehicle, the time for the armored car had not yet come. 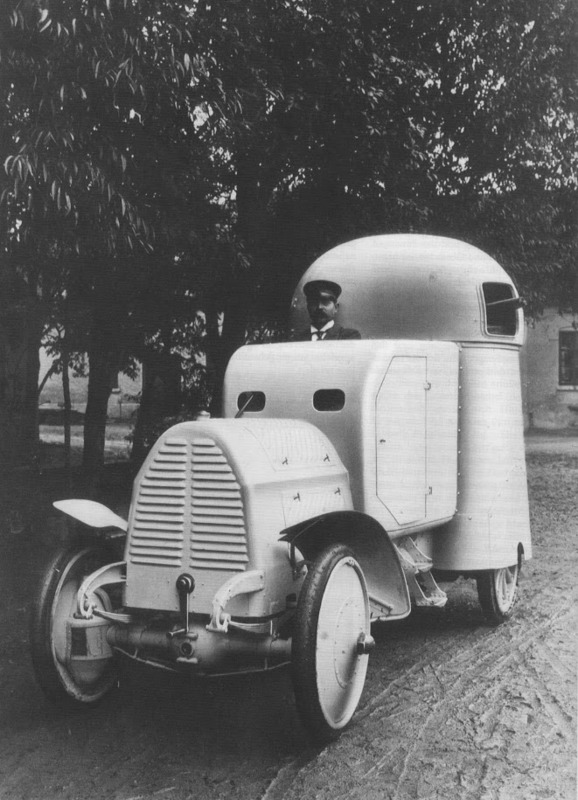 World War I saw a massive increase of armored car designs, and apart from its novel features, none seem to be really inspired by the looks of the Austro-Daimler Panzerautomobil, except maybe for the Belgian SAVA armored car which also featured a curved crew compartment and a dome-shaped turret. A prop armored car, closely modeled after the Austro-Daimler Panzerautomobil, appeared in the 1971 Spaghetti Western movie ‘A Fistful Of Dynamite’, also known as ‘Duck, You Sucker!’. The movie was directed by Sergio Leone, who is best known for ‘The Good, The Bad, And The Ugly’. The film is set during the Mexican Revolution which lasted from 1910-1920. As such, the film features many vintage weapons from the early 20th century, including the armored prop car. Although the vehicle’s appearance is not completely accurate, like the two machine gun ports in an enclosed turret and the edges of the cab being too sharp, it still closely resembles the real vehicle. As with most props, it was dismantled after the filming, but can still be admired in the movie. Kraftfahrzeuge und panzer des österreichischen heeres 1896 bis heute [Motor Vehicles and armored vehicles of the Austrian army from 1896 until today], Walter J. Spielberger, Motorbuch Verlag, 1976. Die gepanzerte Radfahrzeuge des deutschen Heeres 1905-1945 [The Armored Wheeled Vehicles of the German Army 1905-1945], Walter J. Spielberger, Hilary L. Doyle, Motorbuch Verlag, 2002. L’Aube de la gloire : les autos mitrailleuses et les chars français pendant la grande guerre [The Dawn of Glory: the french armored cars and tanks during the great war], Alain Gougaud, 1987. Encyclopedia of Armoured Cars, Duncan Crow and Robert J. Icks, Barrie and Jenkins, 1976. The Encyclopedia of French Tanks and Armoured Fighting Vehicles 1914-1940, Francois Vauvillier, Histoire & Amps Collection, 2014. Age of Tanks: Iron, iron, everywhere S1A1, documentary, 2017. Neues Wiener Tagblatt, November 5, 1905. Neues Wiener Tagblatt, November 20, 1905. Neues Wiener Tagblatt, March 10, 1906. Neues Wiener Tagblatt, March 18, 1906. Neues Wiener Tagblatt, March 19, 1906. Neues Wiener Tagblatt, March 20, 1906. Neues Wiener Tagblatt, March 21, 1906. Neues Wiener Tagblatt, March 22, 1906. Neues Wiener Journal, March 25, 1906. Neues Wiener Tagblatt, March 28, 1906. Neues Wiener Tagblatt, September 11, 1906. Neues Wiener Tagblatt, December 25, 1906. Eisenbahn und Industrie nr. 17, September 5, 1906. Eisenbahn und Industrie nr. 22, November 20, 1906. (Neuigkeits) Welt Blatt, September 8, 1906. Neue Freie Presse, January 29, 1907. Sport und Salon, April 14, 1906. New York Daily Tribune, January 4, 1905. TE Moderator translation: Very impressive pictures!